Published: July 7, 2009 at 02:29 p.m.
Chet Teofilo has played tackle at California, but his future will probably be at guard in the NFL. Offensive linemen keep getting bigger, faster and stronger and 2009 will be no exception. In 1979, the two heaviest linemen drafted -- Max Montoya (UCLA) and Sam Clapham (Oklahoma) weighed 272 pounds. Both had long NFL careers with Montoya playing for 16 years and 223 games. Of the 59 offensive linemen at the 2009 combine, only one -- Ryan McKee (Southern Mississippi) -- weighed less than 300 pounds (296) and just four were under 6-foot-2. The center position requires the ability to do the shotgun snap with accuracy, because most NFL teams run some type of spread offense. Since most centers make line calls, intelligence is very important. The guard position requires a strong player who can block the big defensive tackles that are playing for all teams. Long arms and hand placement are also important. For teams that pull their guards, being able to run well in a short area is important. Quick feet and being a great competitor are other traits that help make a good NFL player. Iupti played as a true freshman in 2006. He will be the starting left guard for the third year in 2009. He is an impact player for the Vandals and is strong and athletic, with long arms and good feet. He was a second-team All-WAC player in 2008, who has a chance to be a good NFL player. Asamoah will be a three-year starter who played as a true freshman in 2006. He is strong at the point of attack, but is a better run blocker than pass blocker. He is smart and has good athletic ability. Beadles is a fifth-year player who has started at left guard and left tackle. He looks a lot like Jordan Gross, a former Ute who is now with Carolina. His best position in the NFL is guard. He is smart and strong, from a very athletic family. He was selected first-team All-Mountain West in 2008. He lacks the quickness to play left tackle in the NFL. Johnson will be a three-year starter at Alabama. He has started at both tackle and guard. He is strong, smart and very competitive. He does not have great speed. He was second-team All-SEC in 2008. Petrus was ineligble in 2008 after making second-team All-SEC in 2007. He was a walk-on who played tight end and fullback as a true freshman. He was a good athlete as an All-State high school basketball player and he runs well. Ducasse moved to the United States from Haiti in 2002. He was a very good high school basketball player and track star in shot put and discus. He played at U-Mass as a true freshman, starting 24 games at left tackle in 2007 and 2008. He is very strong and is an outstanding worker. He is a first-team All-Colonial Conference player in 2008. Carter is a fifth-year player who has started the past two years. He was named honorable mention All-Conference in 2008. He has a huge frame and plays with face paint during games. He has good feet for a man his size and also has very long arms. He played defensive line in high school. He has average speed for the position (5.4 in the 40). Lauvao is a fifth-year player who played on his high school team in Hawaii while in the eighth grade. He has very good strength and is a hard worker. He is a compact player, who will be a three-year starter. He was honorable mention All-Pac 10 in 2008. Smith is a fifth-year player who has started the past two years at guard. He was named second-team All-Mountain West in 2008. He is strong with good feet and speed and can both pull and lead. Render will be a four-year starter at guard. He is a better run blocker than pass blocker. He is strong and was selected second-team All-ACC in 2007 and 2008. Stephens is a fifth-year player who will start 40-plus college games. He was an honorable mention All-Big 12 performer in 2008. He is very strong and smart, but lacks good speed. He moves his feet ok, but he is a zone blocker. 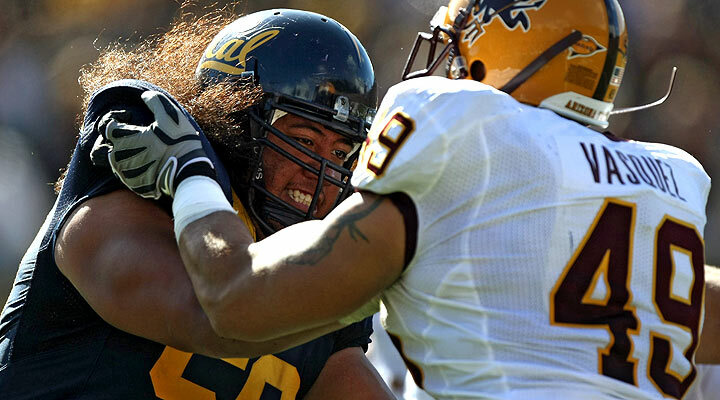 Teofilo is a sixth-year player who played defensive line his first two years at California. He started eight games at tackle in 2008, before an ankle injury ended his season. His best NFL position is at guard. He is very strong and can pass protect. Lewis is a fifth-year player who will be a three-year starter in 2009. He has started at both left guard and center. He needs to get stronger, but he moves well and plays smart. Bender is a fifth-year player who came to school as a tight end and moved to right tackle. He is big with long arms, good speed and quick feet. He needs strength and would be a better guard than tackle in the NFL. Hall is a fifth-year player who has started at all five offensive line positions at one time or another. He has great work habits and shows great leadership. he is well coached by Mac McWhoeter. If you meet him, you won't forget him. Tennant is a fifth-year player who will be a three-year starter for the Eagles. He was an honorable mention All-ACC performer in 2008. He was a smart player with good quickness for the position. He can add weight without any problem. Walton started at Arizona State in 2005 and redshirted. He transferred to Baylor and had to sit out in 2006. He will be a three-year starter after next season. He is strong, smart and a hard worker. Alfred is a fifth-year player with over 30 starts going into the 2009 season. He can also play guard. He was an honorable mention All-Pac 10 in 2008 playing on a very poor team that won only two games. He was smart and strong with good work habits. Larsen is a fifth-year player who started three games at defensive tackle in 2006. He played both offense and defense in 2007 and can play both guard or center. He is a hard-working player who competes on every play. McNeil is a fifth-year player who will be a four-year starter. He is a strong, smart player, but does not look real athletic for his position.